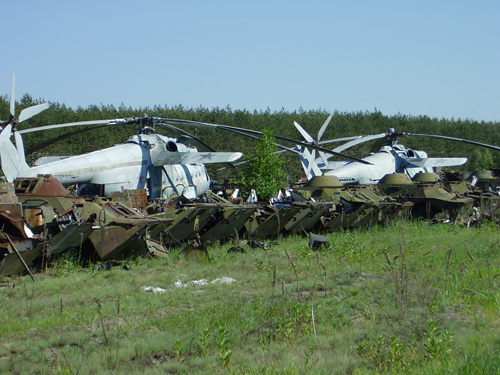 Hundreds of pieces of Russian army hardware is left on the small field right near to Chernobyl. All this machinery has participated in Chernobyl accident liquidation and is radioactive from top to toe. 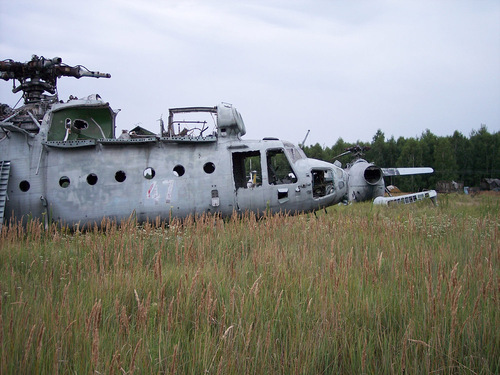 Now it dies out under the open skies of deserted Chernobyl. 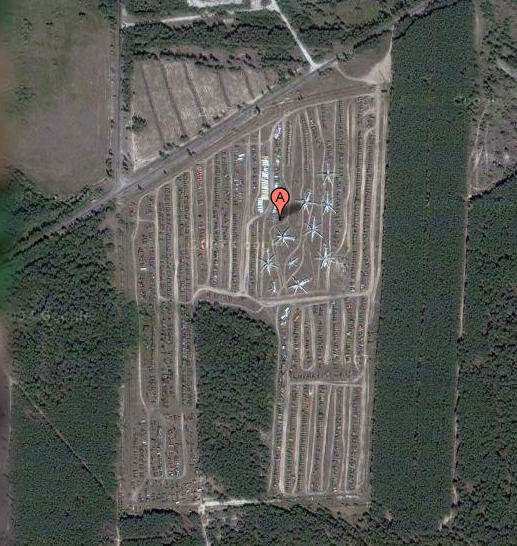 You can get a Google Sat view of it too here. how are the photos safely taken in the radioactive area? surely there must be risk to the photographer? Oh yes it’s dangerous to be there. This machinery dump is actually the only dangerous spot outside the sarcophagus today. 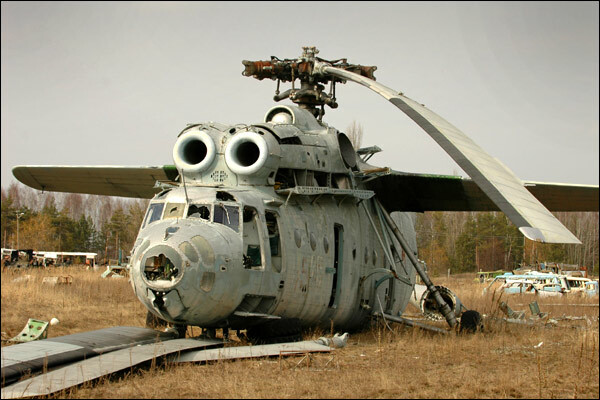 lol this photos not from Chernobyl. And btw, Chernobyl not Russian city it’s Ukrainen. 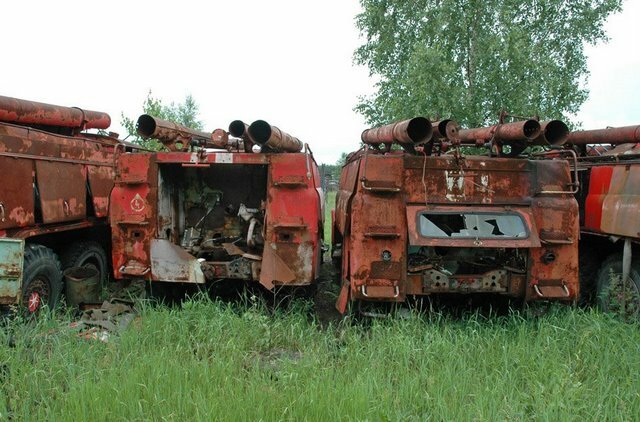 The photos are from Chernobyl (actually a small town near Chernobyl called Rassokha, it’s about 20km away from Chernobyl) and Ukrain used to be part of the URSS so i think the pictures fit this site. Anyways, a lot of metal rusting away, it’s a pitty you can’t recycle it and get read of the radiation. Remember when Ukraine may not be, as the nation itself Ukrainians! Kievan Rus! And there were tribes. United in it! And there were the Aryans! And the town Arkaim etc. etc.. teach the history of the word! There is no Ukrainian or Belorrussii There is one RUSS! Chernobyl was fake.All was photoshoped. At least they had helicopters. Not all the countries have… What then, buckets? 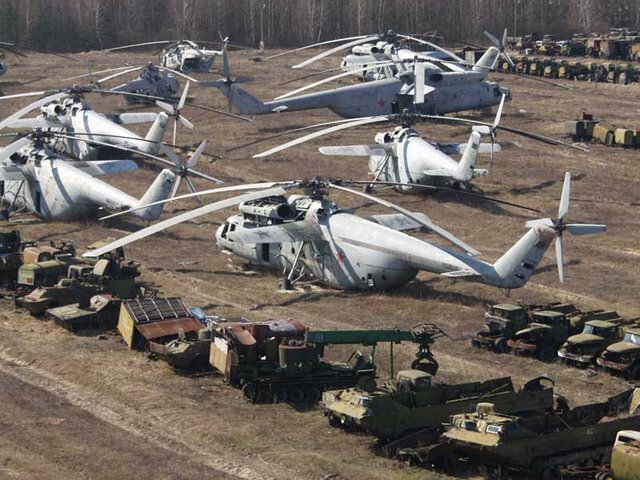 Cool pictures, what model are those helicopters i bet they looked awesome when they were flying. Thanks for letting me know, i just looked on youtube and they look amazing when there flying and taking off, they must have serious power to get them off the ground. aircraft, deer, elk, lynx, moose, mongoose, seacraft. 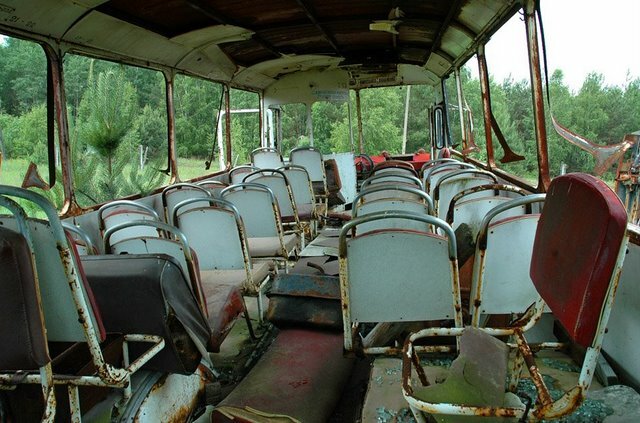 Chernobyl area COMPLETELY safe!! we go there to pick wilde goose berrys. We make sweet wine and sell to tourists. I have never heard tourists complain, this is how I know safety! if you stick to road and use dosimter constantly(take spare battery with you) and with pathifinder-guide[familar with that area]. and stick to main roads and etc – nobody know, where you can encounter marauders or occasionally found runways hideout. …Yet pity that objects are misplaced in CoD4 – I mean, in sniper sequence the sports hall and amusement park for example. Nice authentic graphics in this respect anyway, should try S.T.A.L.K.E.R., too. I wonder. What is the half-life of the decay of modern civilization? Has anyone measured it? does anuone know the name of the tracked truck on the 6th pic down? 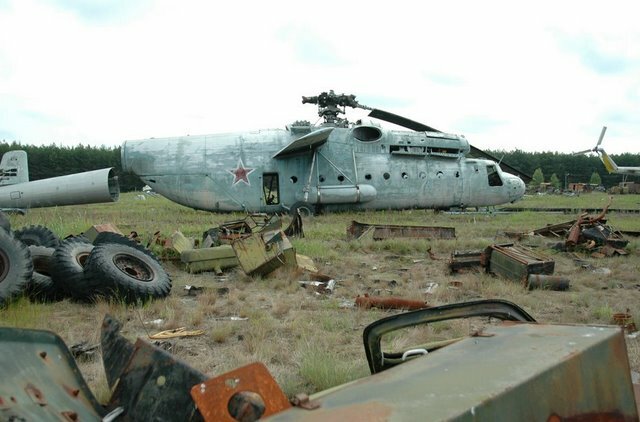 What always gets me puzzled is, this stuff was left ‘as it was’ after the disaster, yet someone has clearly been removing parts of the machinery. 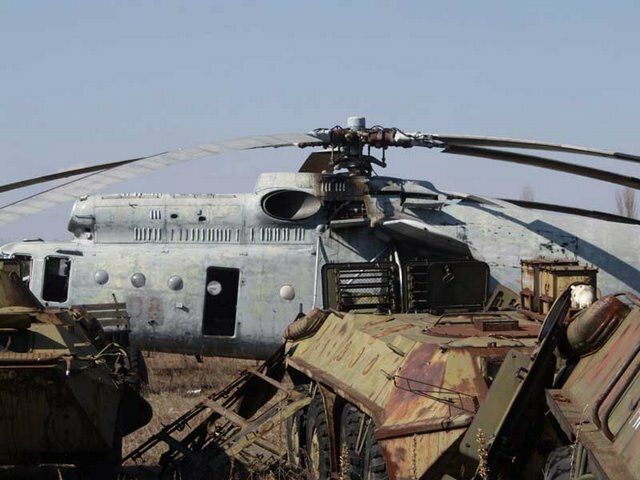 What would anyone want with helicopter rotors? What happened to all the stuff in the fire engines? Who removed wheels and cabs and stacked them up? Odd, isn’t it? “Steel won’t absorb radioactivity” ?? That’s rather crazy: steel becomes radioactive in a radioactive environment. Steel atoms absorb neutrons and protons, and then they become radioactive isotopes of steel, cobalt, or nickel, including radioactive cobalt-60. Also, steel nuclei can absorb gamma rays, thus becoming radioactive, and releasing the gamma rays again at some unpredictable time in the future. I would think that the vehicles themselves have long since ceased being radioactive due to the rain water washing them for around 25 years. However, it is the ground they sit on that would concern me. Steel won’t absorb radioactivity, but the soil sure will. 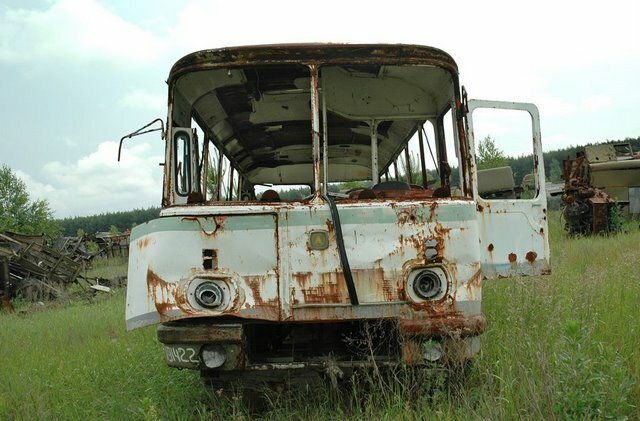 As for the parts, many areas of the former Soviet Union are quite poor. 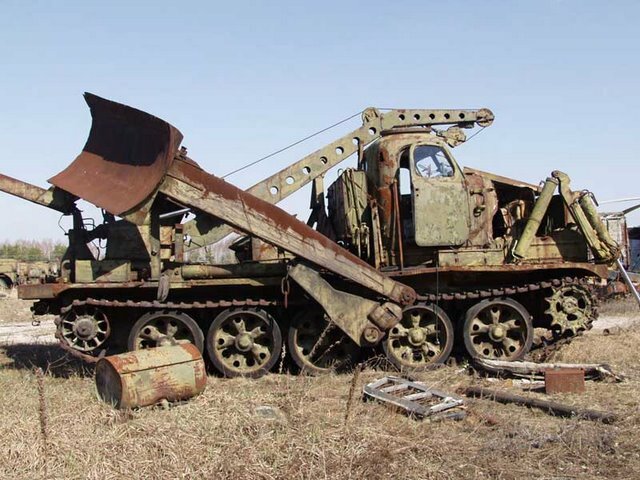 These parts fit vehicles that are still in wide use today such as the Lada cars, and the Tecnick large trucks, which would be about the equivalent of a US military Deuce and a half. 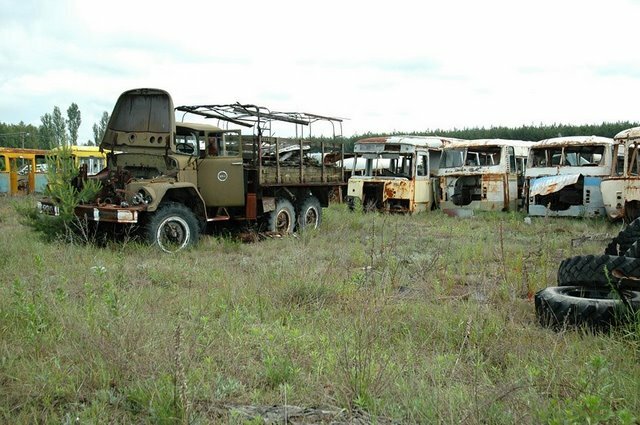 Just like surplus US military large trucks get pressed into service on farms and for road work (I see lots of them as water trucks), so do old Soviet trucks. 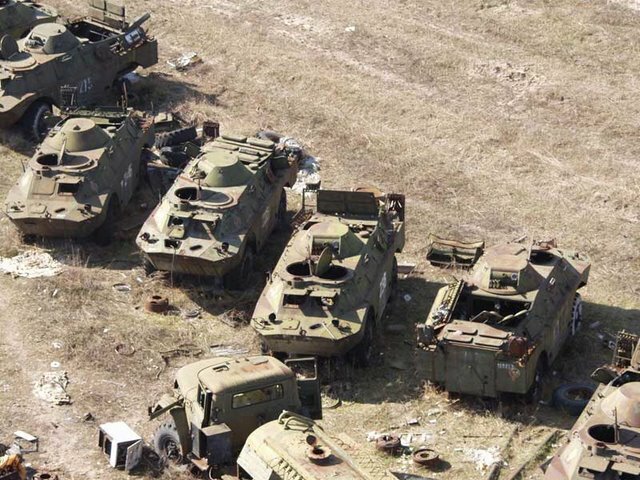 While the mechanical parts are probably mostly ruined due to water getting in them, the bodies probably are not and neither are some chassis parts. 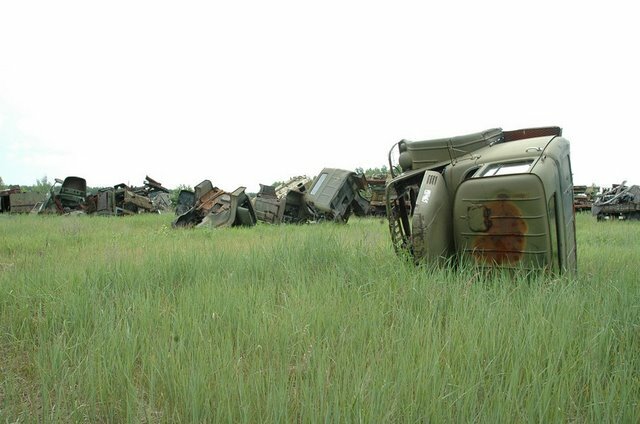 if you are a poor farmer and know of where oodles of spares are sitting abandoned, you might risk the radiation to get what you need for free. Why would equipment that is too dangerous to use be scavenged for parts? 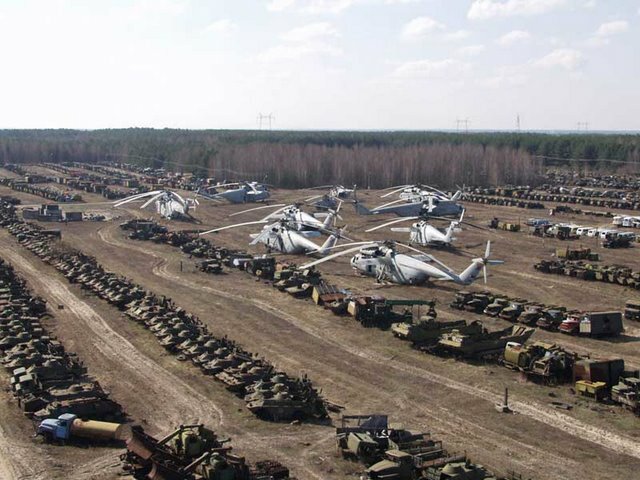 The whole thing has the look of a “boneyard”. 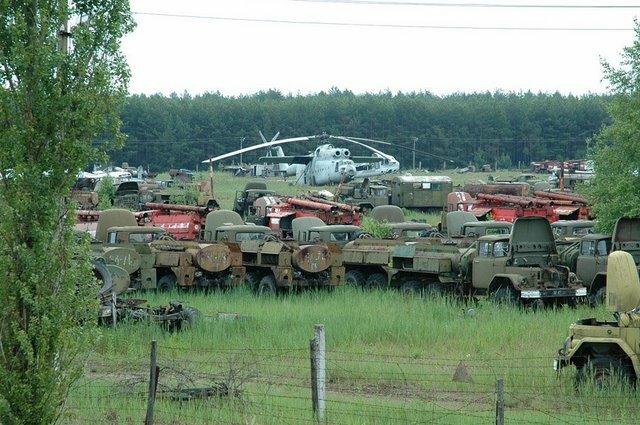 Mostly decommissioned equipment that sits and rusts away with parts scavenged to keep non-decommissioned vehicles running. I pay a guy once a month to come mow the grass and pull the weeds around the area. I dont want it too overgrown. I wonder why everywhere on open spaces near chernobyl trees are growing like mad (even through the pavement) and this place hasn’t got a single three growing on it! Where are the engines of the trucks? I find places like this amazingly cool. I know its perhaps morbid, but its also like a time capsule. 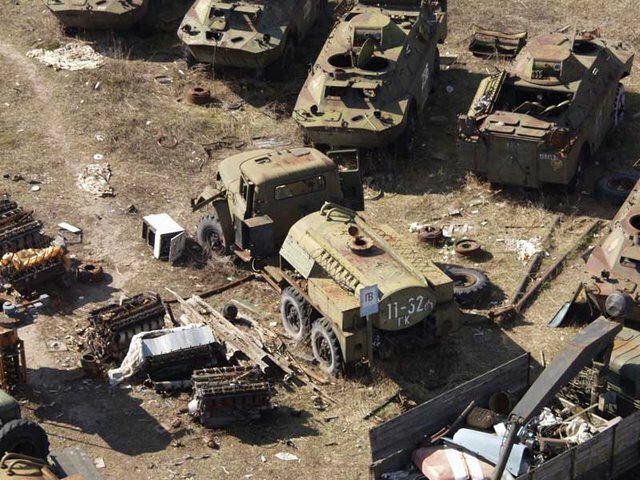 The disturbing thing about these photos, is the number of vehicles with parts missing, hoods in the upright position, some trucks with cabs completely removed… In other words, these radioactive vehicles were partially dismantled for parts. I wonder where some of those parts have gotten to, and whom they have/are slowly poisoning. anodizing metal should remove radioactivity from it or maybe just hit metal with high voltage jolt while emerged.As far as trees go surely their radioactivity deformed,just not noticeably, but maybe not try growing a fruit tree in that soil. All removed and missing parts were sent to China for recycling into toys that were sent to America. bilosh! how did you get out of your cage to go pick wild goose berries?! Just flood the whole place and create a vast lake of different species of fish and aquatic animals. Sadly it wasn’t just the helicopters that got radioactive but also their crews. A number of them died from the effects of radiation. Brave men doing a horribly dangerous job. I would like to say thanks for putting up this blog. I just got in to this will give me a kickstart. Well yeah, and compared to background it is radioactive ? 0.0001% ??? The thin metal is not enough to slow down neutrons, without proper neutron aiming and moderation, the metal is not transmuted. This was all just junk before the cleanup. and as well its an excuse to ask for more $$$ from the Kremlin!. No one wanted it back, and so it sits there. dar va rog, nu va jucati cu focul ! 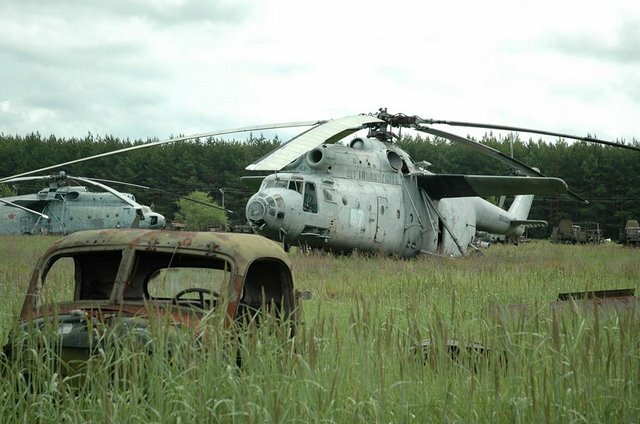 Wow though… That’s extremely scary.. so no body can go there still because of the radioactive particles still around the area..
Wow, that is truly amazing, Would love to have one of those choppers. 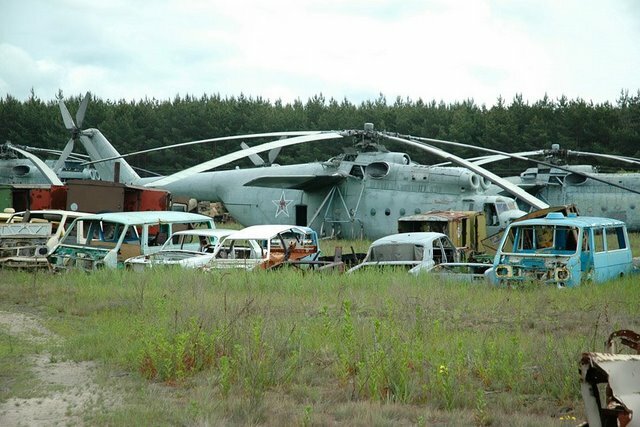 It seems, wisely, all the engines are removed; preventing some stupid people take any vehicle away into the crowd. With a great compassion we are watching the events in the country of the Greatest Democracy, that illuminating the world’s way to freedom. We are concerned especially now when you are running into temporary financial problems, caused by a Washington-based bankers mafia, reaching pickpocketing of ordinary Americans. We know that your country is experiencing a hard time at the moment– closing businesses, increasing unemployment and all mess around. Besides the government is brazenly robbing ordinary white guys in order to feed and appease the growing crowd of Cobra monkeys and dirty Wetbacks. It’s true that we went through this challenges once, in times when Democracy revived in our land, after long years of communist totalitarianism. We gratefully remember the contribution of your country, John to the case of our Freedom. In gratitude for this assistance, I would like to share with you some very helpful advice. When your neighbors losing their jobs, an ordinary white man like you shouldn’t stand up for welfare execute or run for the food stamps. He should step up instead and start up a new profitable business, that’s available to anyone. First of all, rent a fenced area on the outskirts of your town, John. It will cost you a penny these days. Secondly, get some warehouse scales. Park your trailer next to the scales then and fill its fridge with a beer. This is your self-made office now. Furthermore, you shouldn’t forget to hang a large banner above the entrance to a worksite saying “Let’s Clean our County from the Awful Garbage!” and “profitably sell unwanted scrap metal and nonferrous metal”. Keep in mind, the banner must be large! Download wholesale operators’ prices for copper grades 3A and 5A, get as well any other requirements for buying non-ferrous metal scrap. Don’t forget to set the road signs to your work site! The road signs should be large also! Buddy, you will be really amazed to know how much ferrous and non-ferrous metals there are in the universe around you. You are surprised after you print your offer letter and start giving it to your potential suppliers. Don’t be confused with the color of their skin – you are living in a tolerant society after all. Collect EVERYTHING they will give you! While doing you’ll learn a lot of new thing about this world. Some analysts think that recent market prices for copper and other non-ferrous metals are over-heated. And some analytics are damn right! By the end of the first year of new business operations you will have a chance to change your old Ford to a new Jaguar with all of bells and whistles. Moreover, maybe-just maybe – you will decide to write a book about all this. Instead of writing the books start writing something else. Send a message to your Sheriff and State Police – since you will become a truly indispensable man for them. So, do not worry, your business will not be closed. In fact, something quite opposite is going to happen – it will be ignored by the officials, except when they’ll come to you to get paid. Thus, couple years later you will have six pickup trucks with shafts and a dozen of gas-cutters. So you can sell your suppliers some spare parts and fuel. And if we may come across you buy a round of drinks for me. In conclusion, I can say, do not pull the cat’s stain, John. What you have now is an opportunity to start a new Golden Era – the Era of processing collected metals. Do you know the old saying that early bird always get the best worm? Sometimes examines the Google Earth images from 2001 and now. There is already so much has been robbed of contaminated metal and were apparently sold as scrap! Takes her up in your car or bicycle again! Robbed, maybe… it seems to be deliberately and utterly cleared out.